Shad are the striped bass and sand bass bait of choice. There are times when a slab shaped like a shad does the trick!! This lure is not new to the market for sure. But it is a good, solid go to lure for both striped bass and sand bass. The action of the lure is great. It is "soft" on the fall and 'wobbles' to get the fish's attention!! 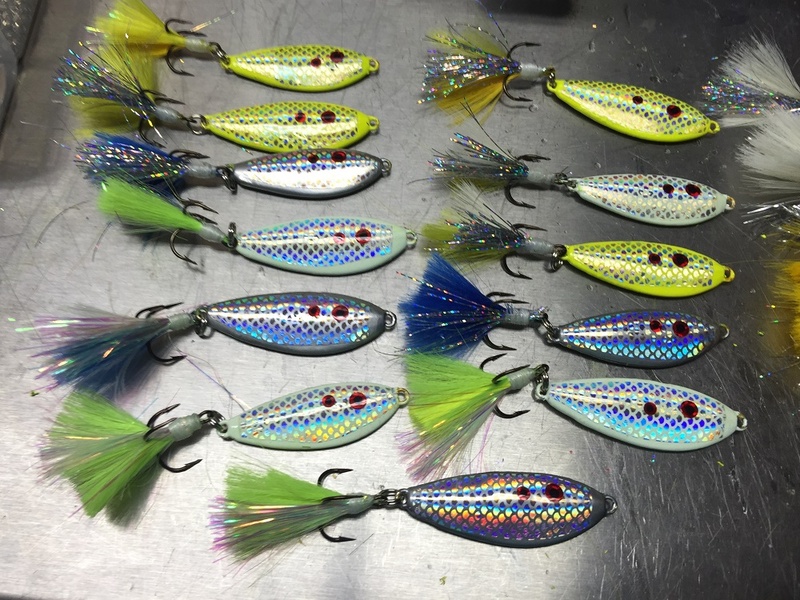 I am proud to start offering these lures. The bodies are durable and come in proven fish attracting colors. I know you will find them as productive as I do. The RL Slabs are available in 1.0, 1.5 and 2.0 ounce sizes. They come in various weights and colors. Buy several so that you are covered. BE SURE TO USE A TEASER HOOK TO INCREASE YOUR CATCHES!! I am now offering this lure with a dressed hook. I select the hook dressing color that goes best with the body. If you slab much, you know the added attraction of a dressed hook to a fish!! BUY NOW !!! BUY AT LEAST 40....MY TRUCK NOTE IS DUE!! This Web Site designed & built by paokie@sbcglobal.net and perfected by Axman! !